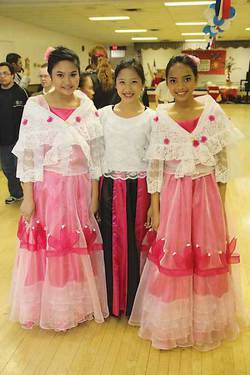 This was a great opportunity for the residents of Wetaskiwin to have a meal of Filipino food, watch dancers and singers and view the colorful dress while at the same time knowing they were helping the Filipino community support a local charity, Wetaskiwin-Camrose Region Catholic Social Services, Sign of Hope campaign. In Wetaskiwin, a City with a population of 12,000 there is an estimated 1000 Filipinos. As Nelia explains, “We have become a big community especially since they have brought in that Temporary Workers program”. The Sign of Hope Society is a non-profit organization responsible for the fundraising and community relations endeavours of Catholic Charities and Catholic Social Services. Every year, the society holds a fundraising campaign throughout central Alberta. Through the generosity of thousands of individuals, business owners, corporations, and social organizations approximately $2.5 million is raised on an annual basis. These funds are critical to the success of programs and services provided to help people of all faiths and cultures in their time of need.